Those familiar with Bertucci’s work from our past reviews, or even from her live performances, should throw out everything they know when considering the new release. To start, the opening cut is a flute piece: a sound collage that incorporates “an earworm from the Bulgarian folk song Dragano Draganke.” The collage imagines the process of forgetting, or at least trying to forget, a melody that is already embedded in the mind. As one can imagine, the process fails, while the composition does not. The more Bertucci alters, hides, or abrades the reel-to-reel snippets in beds of feedback and static, the more they insist on being heard; the listener searches for them while the artist tries to forget. Or does she? The concentration on forgetting is itself a form of memory. 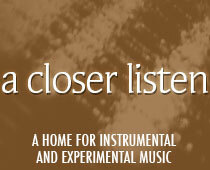 As the release is available on tape, the invitation to the listener is twofold. One might enjoy the extraction, and seek out the original; or one might further its deterioration by whatever means may be at hand. The tape’s other collages are more sedate, yet intricate in nature. The title track teems with curious electronics lurking below a skein of ice. One can imagine the wind, the frozen shore, the crackling ice pellets. The composition sounds like a field recording, as crisp as sub-zero air. Each pinging icicle is preserved in pristine fashion. When the storm ends, the icicles are replaced by chimes, and glissandos enter like pitch-shifted wolves. Bertucci hangs her notes like curtains against the cold. Only in the closing seconds do human elements intrude: a low rumble of mall sound, pierced by a high-pitched tone.